It's time this week to revisit and old (i.e. - one we've already played with) form. An abecedarian poem is one in which the verses or words begin with successive letters of the alphabet. I was inspired to think about this form again because I've been reading When You Are Alone / It Keeps You Capone: An Approach to Creative Writing With Children by Myra Cohn Livingston. In it you'll find a poem written by a ninth grade boy that begins this way. It's really a silly little thing, but it reminded my of how many clever and interesting ways there are to write a poem. So, your challenge for the week is to write an abecedarian poem. Leave me a note about your work and I'll post the results here later this week. 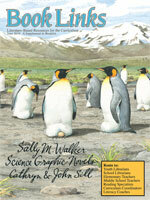 Check Me Out In the June Issue of Book Links! This month you'll find me sharing a thematic book list somewhere besides this blog. Check out the June issue of Book Links for my article entitled Titles That Sing and Shine: Books about Sound and Light. You'll find poetry, fiction, informational titles and activity books for grades K-6. You'll also find a sidebar on scientists of light and sound with suggested titles for learning more about Thomas Edison and Alexander Graham Bell. If you can't get to the article right away, check out some of these web sites about light and sound. Finally, check out this Poetry in the Classroom post entitled Lighting It Up for even more ideas on teaching about light. Today's poetry stretch takes the form of thievery. Actually, imitation is the sincerest form of flattery, so let's think about this as an exercise in honoring our favorite lines of poetry. Today's exercise in mental gymnastics takes the form of the cento. The cento is a poem made entirely of pieces from poems by other authors. Centos can be rhymed or unrhymed, short or long. You can read more about the cento at Poets.org. I also like this article about found poetry. Not one to stick with the rules, I wrote using adult titles on my bookshelf. love is lost to the housekeeping. and all creatures great and small. and walks where angels fear to tread. by a thread of grace. on the shadow of the wind. that the Lord God made them all. Here are the books that make up this cento. So, do you want to play? What kind of poem will you assemble? Leave me a note about your poem and I'll post the results here later this week. Well, it appears that last week's challenge put me in a bit of hot water. Sheesh! I didn't think it was THAT hard. Here are the results for macaronic verse, or poems that include bits and pieces of another language. or cut the abundant grasa. or lift the heavy masa. or buy a movie pasa. or polish up the brasa. or shelve books in a casa. I'm not going to win the raza. you can get into the fair. with the long spaghetti hair. English can bee sew confusing. You my teacher good and friendly. Gracias for help and tries. Here’s a card – “In Sympathy” – What?! It’s for when someone dies?! The Handbook of Poetic Forms defines macaronic verse in this fashion. Macaronic verse is a peculiar, rare and often comic form of poetry that sometimes borders on nonsense. It is a mixture of two (or more) languages in a poem, in which the poet usually subjects one language to the grammatical laws of another to make people laugh. You can read more at Wikipedia and learn a bit about the history of this form. I was interested to note that the Carmina Burana (which I sang eons ago in high school) is a fine example of this. So, your challenge for this week is to write a poem that uses more than one language. If you don't know another language, make one up. Pig Latin, anyone? Leave me a note about your poem and I'll post the results here later this week. The challenge this week was to write about something hot. Here are the results. Kate Coombs of Book Aunt shared this untitled poem. Soon it will be night." a spade into soft soil. the size of my thumb. Diane Mayr of Random Noodling shared this untitled poem. Jone of Deo Writer shares a poem about the heat. While I continue to dig out from under a pile of work, please enjoy this brief interlude. And yes, it IS better than Wizard's chess! I seem to have fallen off the face of the earth where blogging is concerned. I'm swamped with work right now, but wouldn't dream of letting down all you folks who take up challenges with me. I don't know what it's like where you are, but it's darn hot here. I hope this isn't a sign of things to come. I have lived here nearly 16 years and I still don't like the summers. I don't miss the Buffalo snow, but I do miss the summers and the fall. Okay, enough of my stream of consciousness on the weather. Let's write about something HOT. Leave me a note about your poem and I'll post the results here later this week.